Anders Hove plays Faison, a classic villain who has been in and out of Port Charles going back to 1990. 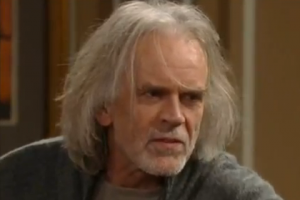 He’s Danish and with his long hair and wrinkles is perhaps the most bedraggled looking character on all of daytime TV. His visits usually have to do with his obsession with lady love Anna Devane and with his favorite diabolical undertaking, kidnapping. This time he’s in town after revealing to Anna that her daughter Robin (who his bossy wife Dr. Obrecht abducted a year and a half ago) is still alive. Hove’s latest visit is so much fun because we’re getting to see the domestic side of the Great Dane. He’s continually in conflict with Dr. O, his quarrelsome spouse from hell (the outstanding Kathleen Gatti). The two fight like the old married couple that they are. This time he’s also fighting with evil daughter Britt (does the apple fall far from the tree? ), who has introduced him to his “grandson” Ben, who is not biologically Britt’s son. It’s hilarious to see this villain kiss his “baby.” We hope Faison sticks around, even if at the moment he should still be in jail for impersonating Duke Lavery. Finola Hughes is always a treat since her spy/police chief character Anna Devane came to town in the 80s. She is what soap women rarely are: career oriented and mature but still vulnerable and brimming with emotion. Now she’s obsessed with finding her daughter Robin, who has thought dead for some time but is still alive. The most interesting recent Hughes moment came with her impersonation of the vile Dr. O, who wore a mask impersonating Anna. She was an actress pretending to be a character pretending to be her character. Tricky stuff, and Hughes made it a jolly tour de force, complete Dr. O’s signature hauteur. Elsewhere, she played herself with equal charm in some marvelous scenes with Hove. Bryan Craig. We’ve been very rough on Craig who plays Carly and Sonny’s son Morgan. As Kiki’s husband, he was very weak. However, since Morgan has hooked up with older woman Ava Jerome (the outstanding Maura West), Craig’s performances have gotten better. Perhaps working with the accomplished West buoyed him. Now he’s a lot more forceful. Going forward, it should be interesting now that he’s discovered Ava’s brother Derek is really his father’s enemy, mob boss Julian Jerome. Ilene Kristen. Here’s a big soap surprise. It seems that GH is incorporating the old soap Ryan’s Hope and Kristen’s character Delia Reid Ryan into its own storylines. Sam and Silas will go to the Upper West Side bar to find out if Delia is really the mother of Ava Jerome. We can hardly wait to see Kristen (formerly Roxy on One Life to Live), who is always kooky and funny, in her two appearances scheduled for this week. Moose Says: General Hospital Can Snare … the Soon-to-be-Prized Old Guy Demographic? Marlena says: Soap fans everywhere are cautiously optimistic that, against all odds, there’s been a hopeful turn in the heretofore bleak fortunes of soap opera. Ratings are strong and even improving for the four network soaps that survived the death watch of the past few years, and Prospect Park is said to be moving full steam ahead to bring two of the casualties back from the dead. Is it too soon to rejoice? Skeptic that I am, I’m not ready to shoot off fireworks at my country retreat just yet. But I’ve has detected one tiny, tiny bit of anecdotal evidence that audience-building may, indeed, be possible: My recently retired husband Moose, long impervious to the many charms of soap opera that have inundated him daily for so many years, has been espied of late … actually watching General Hospital. At the risk of frightening him away, I asked him to share with Thinking Fans, whose analytical powers are legendary, after all, what it is about GH that has finally captured his attention. He agreed. Listen and learn, GH producers. Or, at least, have a chuckle or two.